So I made the mistake of rediscovering the Shop Goodwill website. Not only are there bargains to be found, there are some pretty crazy things listed if you take the time to look. And it combines my love of auctions with my love of thrifting. Mattie’s paying me back, but I won him 2 big lots of mixed Legos (about 30 pounds of them total) for about $150. We got the first lot of them yesterday and holy cow! Check it out. 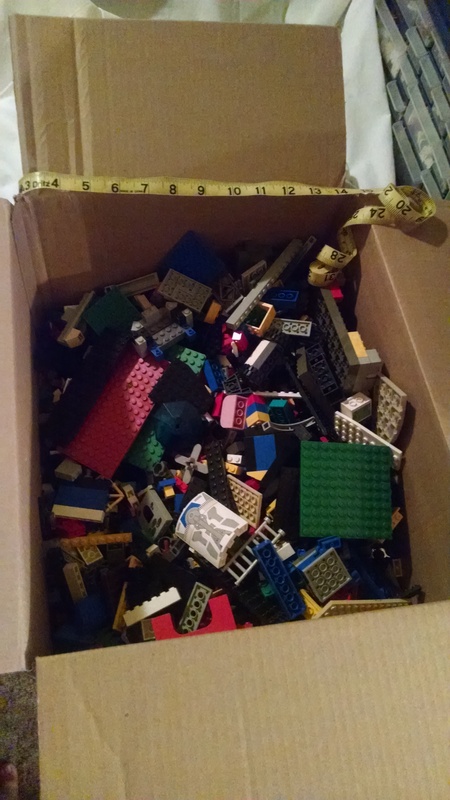 The box is slightly longer then wide and about as tall as it is wide- and he had already taken some Legos out of it. Lots of good pieces of all different shapes and sizes, though there were a few random Duplo blocks and a couple Legos that had been damaged- some were burnt? Weird. The other two boxes I won him are about 1.4 times this amount total, so he’s going to be sorting them for a while. On Saturday evening, I checked to see what was listed at Integrity Public Auction, a local auction house. Sometimes they do internet only auctions, and sometimes they allow absentee bidding for live auctions. The current auction when I had a peek was for absentee bidding, and I saw something I couldn’t resist and had to bid on. I ended up winning this little beauty for $20 and picked it up on Sunday afternoon. Its a little soprano and maybe even brighter in color in person. It sounds a little plinky but I still like it. I’m having some trouble not muting the strings a bit with my forearm when playing it- its teensy size is really throwing me off! I wasn’t supposed to buy another uke because I actually have one from Goodwill on its way to me now. It should be arriving on Wednesday- another soprano. One last auction find for today. Here’s some history. 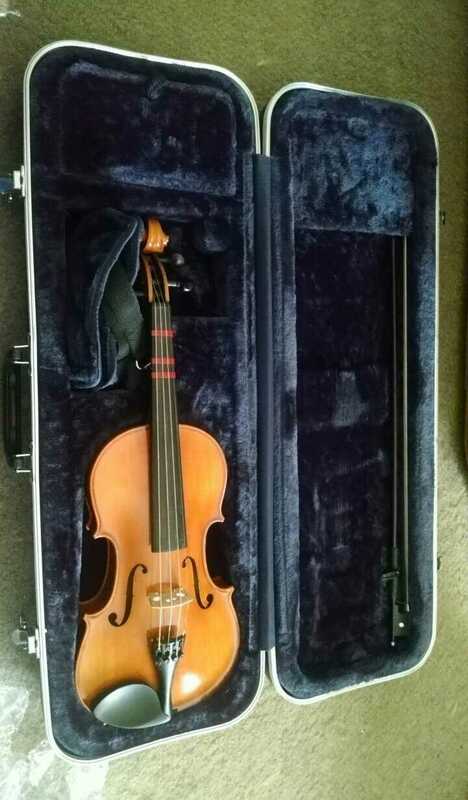 I have always loved violin and fiddle music. They make me happy. But its a notoriously difficult instrument and also expensive. I’ve been looking though and I found what I hoped would be a great deal on eBay. I bought it and I spent about a week freaking out that it would be destroyed in the mail. Finally, yesterday, I received this box. 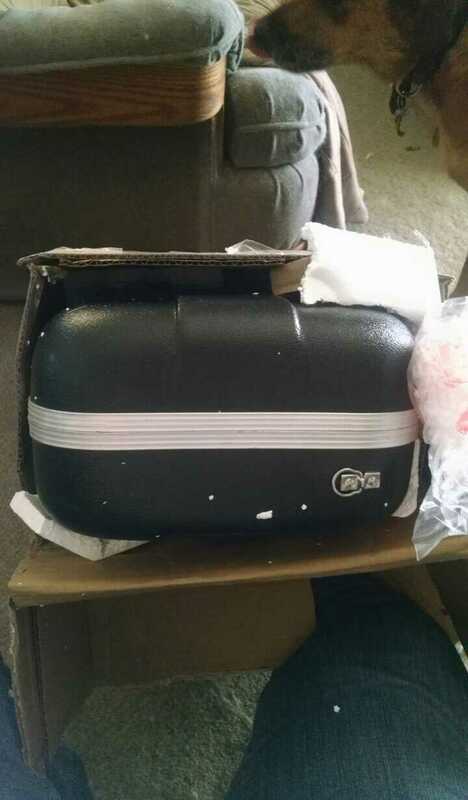 It took me about ten minutes to get the end of it open, but it was definitely packed securely and the inside was lined with chunks of Styrofoam and wadded up plastic. This was what I felt like I had been waiting half my life for. I finally got it out of the box and opened the case. 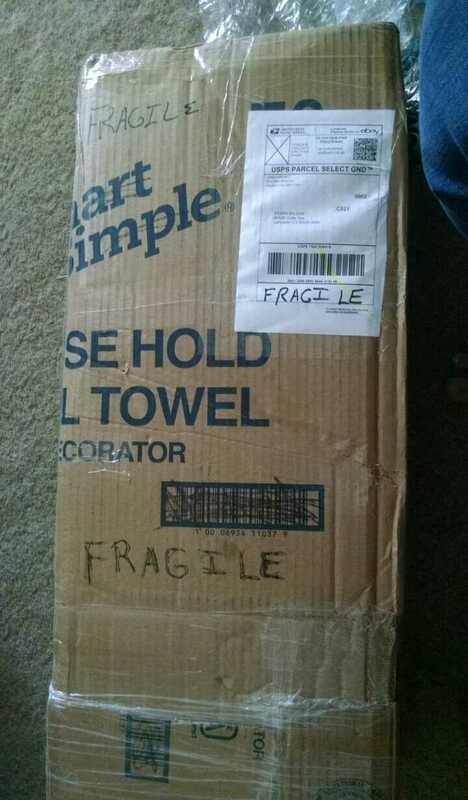 I was so worried that maybe it got trashed in the mail, but nope, its perfect. I then took it over to Tapp’s Music and asked them to give it a once over and tell me if anything was wrong with it and if it was a suitable beginner’s instrument. It passed muster, so then I asked for contacts for instructors to teach me how to play. I left with two business cards, one for someone who teaches classical violin and one who teaches violin and fiddle. I called the fiddle lady when I got home and set up for my first lesson this Friday. I’m super excited!